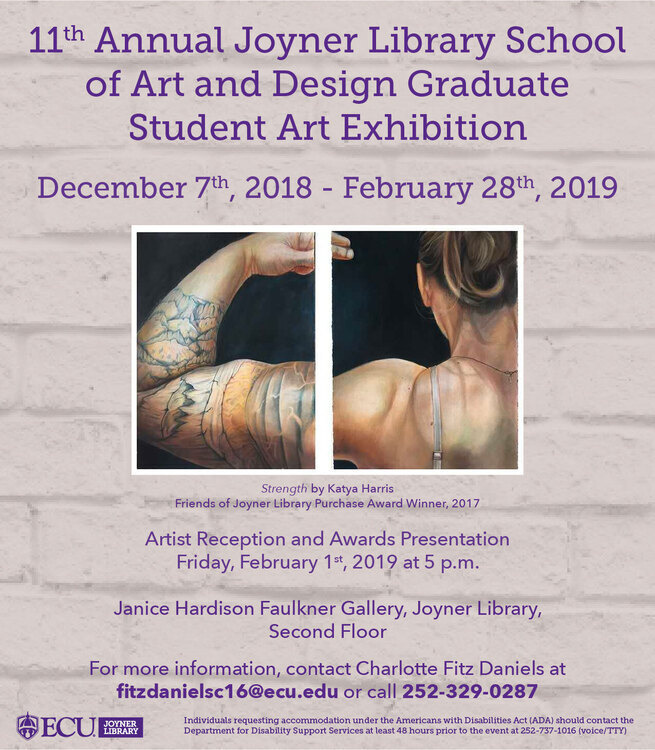 The 11th Annual Joyner Library School of Art and Design Graduate Student Art exhibition will be on view from Dec. 7th, 2018 until Feb. 28th, 2019 in the Janice Hardison Faulkner Gallery. There will be an opening reception on Feb. 7th at 4 p.m. in the Faulkner Gallery. Awards winners will be announced at approximately 4:30 p.m. The exhibition features artworks by current graduate students in ECU's School of Art and Design. Diverse works include paintings and drawings, textile and metal designs, sculpture, photography, pottery, and more. The exhibit and reception are sponsored by the Friends of Joyner Library.